The mansions constructed during this period numbered in the hundreds. The land, formerly covered in a patchwork quilt of Quaker farms, was transformed into sprawling, British-style country estates with magnificent manor houses surrounded by equally impressive manicured gardens and grounds. Though their numbers are down to but a handful and even fewer are still privately owned, there are reminders of that long gone era. Many of the mansions are publicly owned and others still exist in another capacity – a college, a museum, a religious institute or state and county parks. 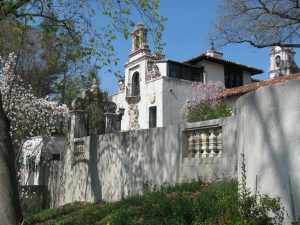 Several mansions and gardens are open for the public to enjoy. Now the Suffolk County Vanderbilt Museum and Planetarium, the 43-acre estate is a popular historic, cultural and scientific destination for regional visitors. 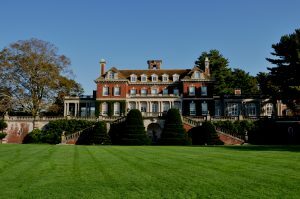 At Old Westbury Gardens you’ll find a spectacular mansion and arboretum. The Westbury House mansion, virtually unchanged from the time of the Phipps residence, still contains the family’s collection, furnishings and fine arts. 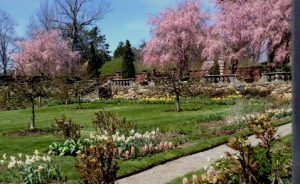 The Gardens’ 160 acres include the Walled Perennial Garden, the Boxwood Gardens, the formal Rose Garden, Cottage Garden and demonstration gardens, as well as sweeping lawns, over 100 species of trees, rolling fields and wildlife. 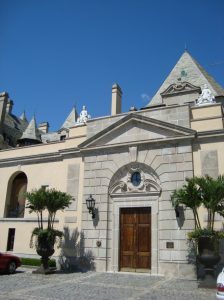 Oheka Castle, a magnificent Gold Coast Mansion in Huntington, emanates the elegant refinement of a chateaux in France. Original owner, Otto Hermann Kahn, commissioned celebrated architects, Delano and Aldrich, to design his palatial country residence to accommodate Kahn’s fondness to host lavish parties. Today, Oheka is recognized as one of the most prestigious wedding and event venues and Historic Hotels of the World. The Castle also has 32 luxurious guestrooms and suites situated on the upper floors of the estate, where guests can sleep like royalty. Visitors can call ahead for Historic Mansion Tours of the Estate and Gardens; and the newly opened OHEKA Bar & Restaurant offering patrons a unique culinary experience with beautiful views of the manicured Formal Gardens, designed by prominent landscape architects, The Olmsted Brothers. No longer exclusive as a seasonal retreat and playground for the elite and powerful, the North Shore now welcomes all to enjoy its beauty and wide open space. Located beyond the encroachment of much of the over-building in the NYC metropolitan area, the winding, wooded roads lead to charming villages once frequented by the elite who lived here.